Clothing/Jewelry Description A red and white long-sleeved t-shirt and a diaper. Tanya was last seen in Center, Texas on June 7, 1983. She was visiting her paternal grandparents at their home half a mile down a dirt road off Highway 7 when she disappeared from their backyard at dusk, shortly after 8:00 p.m. About twenty minutes passed before anyone realized she was missing. She has never been heard from again. 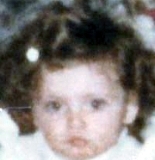 Investigators could find no evidence that Tanya wandered away from her grandparents' home; they believe she was abducted. Her case remains unsolved. Updated 2 times since October 12, 2004. Last updated February 8, 2019; date of birth, height and weight added.